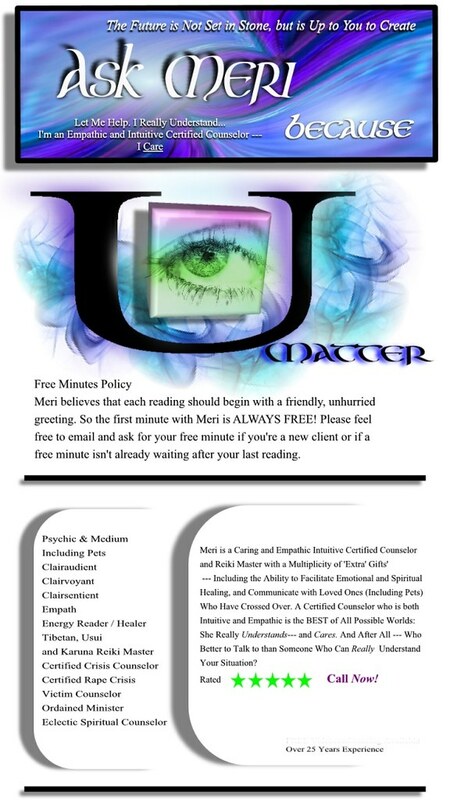 Meri is a real, multi-talented professional Psychic Medium, Police Psychic, Energy Healer, who Provides PROOF of ACCURACY & In-Depth Consultations! Get FREE and DISCOUNT MINUTES ~ Just Call NOW & Ask! X01182. PING for chat! If Meri is unavailable or busy, please arrange a callback or make an appointment. If you are unable to get through using the call button and Meri appears to be available, call her at: 1-800-ASK-KEEN, Ext. 01182. PING Meri to chat! Meri is Very Question-Driven so Please Feel Free to Ask Any and Every Question You Have and to Be a Full Participant in Your Love or other Reading. *Special Offers may change at any time, without notice. International callers not eligible for offers. Multiverse Psychic Medium Meri has been a user of Keen since 2002. Getting Love & Relationships advice from Multiverse Psychic Medium Meri through www.keen.com is safe, secure and confidential.